Of all the household items that have been enhanced with technological components, this product may be the most unexpected. 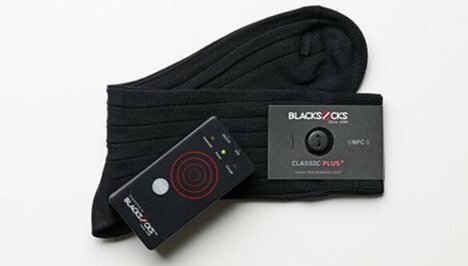 A Swiss company called BLACKSOCKS has put RFID chips in – you guessed it – socks. But it isn’t to track down those oft-joked-about missing socks that go AWOL from the dryer; it is actually part of a very sophisticated system to keep your foot clothes looking and feeling just right. The Smarter Socks system involves an RFID scanner and an iPhone app, along with regular deliveries of fine Italian socks. After a load of socks is washed, the user scans each sock with the RFID scanner. 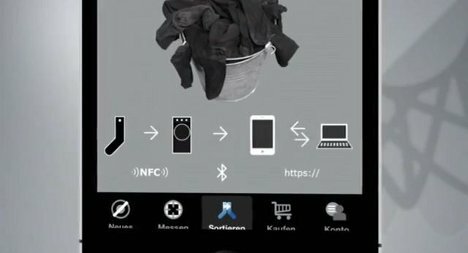 The scanner sends the sock’s info to the app via Bluetooth, telling how old the sock is, which matching sock is its sole mate, how many washes it has endured, and which foot it goes on. The black socks will, like all black clothing, fade over time – that’s why the app’s Blackometer function tells you when your fancy-pants socks are “no longer properly black,” then helps you order new ones. This seems like overkill, but if you’re going to have electronic socks you might as well only wear the nicest-looking ones possible. If one of your socks manages to escape and you just can’t find it, the app allows you to pair up the remaining partner with another match-free sock to form a brand new pair. The company behind the system admits that while their product is pretty great, it can’t eliminate the chore of matching up socks entirely…which is kind of what we’re holding out for. See more in Futuristic or under Technology. October, 2012.